Border Agent: It says here you have settled status. What category is that in? Me: I don’t know. What are the possible categories? BA (already almost yelling): You must have had some basis for receiving settled status. * Was it Tier 1, Tier 2, Student, Spouse? Me: I was working. I had a work permit. BA: What was the category of the work permit that you first entered the UK on? Me: I don’t know. It was ten years ago. BA: You need to know that. You can’t enter without that information. Me: I thought the ILR card has all the information I need to enter. BA: I have the card here. You need to know it. Me: Well, I don’t. I’ve forgotten. How can I find it out? BA: You should know it. It must be in your paperwork, or an old passport. At that point she just gave me a particularly menacing scowl, stamped my passport, and let me through. Until now, I’d thought that ILR should leave me fairly unmolested at the border, and that’s mostly been my experience, but this servant of the Crown clearly thought that my ILR status was somehow a sneaky trick, and she resented the fact that she had to let me in on such a flimsy pretext. I don’t know if this was just an individual unpleasant character, or if this is the developing shape of Theresa May’s planned “hostile environment” for foreigners. (People forget that May has been pushing this notion since long before Brexit.) She says it’s only for “illegal migrants”, but UKBA may be reading between the lines. * It’s funny, with her obsession with my failure to remember the precise bureaucratic immigration categories, I think she was using obsolete terminology: I believe “Indefinite Leave to Remain” replaced the older “Settled” status. The rush to witness the “authentic” ultimately alters the reality, in a kind of behaviourist butterfly effect. Once again, physics clichés are being confounded. When you’re looking for an educated-sounding way to make the banal observation that it’s hard to observe things without getting mixed up in them, and so changing them, the cliché you want is “uncertainty”. The “butterfly effect” is what you cite when you’re bloviating about how small actions can have large long-term effects. It’s slightly depressing for anyone who has hopes for general science education. It suggests that even if you come up with compelling ordinary-language metaphors for scientific concepts, the result will just be a salad of interchangeable expressions gesturing vaguely at an undifferentiated mass of physics woo-woo concepts. In the week after the September 11 attacks, my Berkeley colleague George Lakoff got rounded up in a dragnet of conservative outrage for a heartfelt reckoning with the meaning of towers and the violent destruction thereof. Whether or not you agree with his points — which were mostly anodyne applications of his general theory that all abstract thought is at base metaphorical, but which seemed to offend people mainly for the brief mention of one very traditional metaphor, the tower as phallus — it was almost a prototype for what people think a public intellectual should be doing: bringing the fruits of his technical research to bear in making sense of confusing events, and public responses. Anyway, I’ve just been visiting Washington DC for the first time since I was a young child, and I was struck by the differing levels of security at the two monuments to great American presidents that stand on opposite ends of the reflecting pool. The towering Washington monument has airport+ level security: Metal detectors, no large bags, no food or drink. The squat Lincoln memorial has no security at all — not even the health-and-safety guardians whom one would expect at any modest monument — with people walking freely in or out. It doesn’t seem wrong. Somehow it feels intuitively obvious that a tower would attract political violence in a way that a squat temple would not. It’s similar to the issue of why terrorists always like to hijack airplanes. There are more people on a big train than on any airplane, but still terror attacks on trains are rare, despite the vastly tighter security at airports. The newspapers are full of the new rules, requiring that electronic devices be powered up at the security checkpoint before entering flights to the US. Apparently, this is in response to information that terrorists may be hiding explosives in smart phones. I am reminded of my favourite bit of security theatre, from about 2006. Passing through security in Montreal, the man ahead of me had a bag filled with small cans and jars of what looked like Jamaican delicacies. Solid food is permitted on the plane, but liquids are forbidden. But these were in sealed tins, and obviously you couldn’t open them all. So the security agent did what any reasonable person would do: He read the labels to determine the contents and quantity. All the cans and jars were cleared to be taken on the flight. Why should David Miranda keep David Cameron’s secrets? One more thought on l’affaire Miranda that hasn’t, I think, been sufficiently represented in the public discussion: What is stolen information? If David Miranda had picked up the British crown jewels in Berlin, and was flying them to Brazil, and was foolish enough to change planes in Heathrow, of course the police would have every right to stop him there and confiscate the jewels. In fact, though, Miranda was carrying information. If his memory was good enough — if he had a photographic memory — he could have carried it in his head. He is a Brazilian citizen who has, so far as I know, no connection to the UK. What possible justification could there be for expecting him to keep British secrets? If we consider the implications of countries stopping travellers in transit, to examine and confiscate the information they are carrying, it is chilling. And again, what if the traveller is carrying the forbidden information in his head rather than on a hard drive? I’m sure I know many things which whose distribution could benefit enemies of, say, the Iranian state, or the Chinese. Author steinsaltzPosted on August 23, 2013 August 23, 2013 Categories PoliticsTags espionage, international, travel, UK politics1 Comment on Why should David Miranda keep David Cameron’s secrets? I’ve just returned from my sabbatical in Berkeley, and while I’ve written some harsh criticism of life in the US when it unfortunately intersects with the medical system, as long as you can stay healthy there are some conspicuous advantages to life in Berkeley. Particularly if you walk or ride a bicycle. 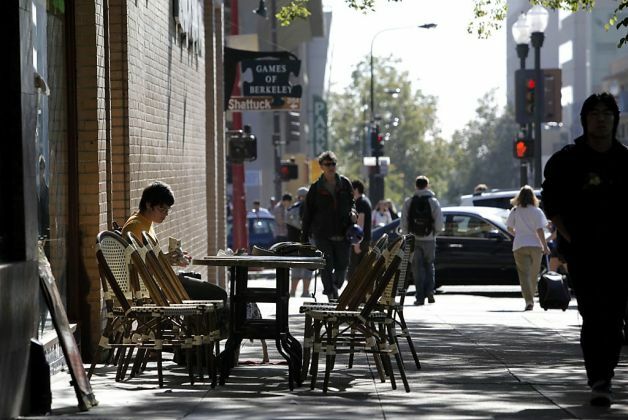 Some of it is no one’s fault: There’s obviously more space in Berkeley for wide sidewalks, and the crush of tourists on a few major boulevards, particularly in summer, is peculiar to Oxford. On the other hand, Oxford city council chooses to allow merchants to block half of the narrow pavement with advertising signs. Still, with the narrow, often one-way streets, Oxford is no paradise for drivers either. And maybe that’s part of the reason why Oxford drivers are, there’s no way to prettify this, hateful toward non-drivers. (Presumably toward other drivers as well, but I haven’t had that experience.) Not all of them, of course, and not all the time, but enough to make cycling something I avoid when I have time to walk, and makes me feel on edge much of the time even when I’m walking. Berkeley drivers are sometimes thoughtless, of course, but the threatening incidents of recklessness still seem less frequent in Berkeley than the incidents of active aggression and rage in Oxford. Cycle lanes are occasional and intermittent, and the average Oxford driver considers “cycle lane” to be just a fancy word for “free parking”. We don’t have as much of a problem with restaurants or constructions sites parking their dumpsters on the cycle lanes as they apparently have in Belfast, but here’s a cheeky comment on their difficulties. I suspect that the better conditions in Berkeley are a good example of the civilising influence of the law. California law requires that drivers stop for pedestrians in any crosswalk, whether or not it is marked. And they do. Nearly always, except on high-speed highway-like urban roads, and even there if you make yourself conspicuous you’ll usually get someone to stop pretty quickly. This gets people into the habit of paying attention to slower travellers using the road, and frequently they’ll stop even when they are not required to, for instance, for pedestrians crossing in the middle of a block, or for cyclists on a cross-street. In Oxford, as in all of England (I have been informed), cars are required to stop only at elaborately constructed official zebra-striped crosswalks with huge flashing lights overhead. Because of the elaborate construction these are rare, and even so are often ignored. And I can certainly count on the fingers of one hand the number of times in five years that any driver has stopped to let me cross the street as a pedestrian when it was not strictly required by law. It didn’t matter if it was snowing or pouring rain and I was out walking with a small child. 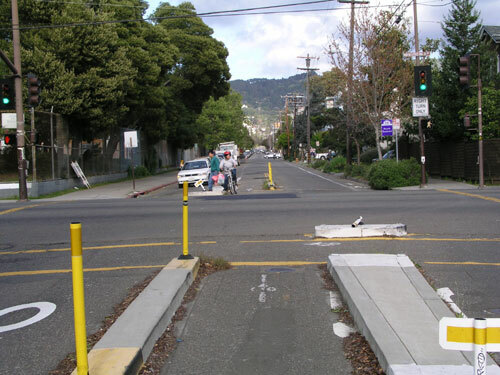 In Berkeley I was more likely to be embarrassed by a car stopping for me to cross when I was merely loitering near to the crosswalk. Absent from this list is “possessing information that would help terrorism”. The rest is just a smear, and the insinuation of what the journalists are “condoning” is just disgusting, reminiscent of the “fellow traveller” smears of the 50s. Despite the incredibly broad powers granted to the police by the infamous section 7 of the Terrorism Act 2000, British police seem to have managed to overstepped their authority in detaining David Miranda. They don’t need any reasonable suspicion of anything, but their actions may only be directed toward determining whether the person is a terrorist. An examining officer may question a person to whom this paragraph applies for the purpose of determining whether he appears to be a person falling within section 40(1)(b). (b)is or has been concerned in the commission, preparation or instigation of acts of terrorism. The questions, [Miranda] said, were relentless – about Greenwald, Snowden, Poitras and a host of other apparently random subjects. “They even asked me about the protests in Brazil, why people were unhappy and who I knew in the government,” said Miranda. Note that the law seems (to the untrained eye) extremely specific about the permissible purpose of the detention and questioning. It is only for the purpose of determining if the person is a terrorist. Will the lawbreakers be brought to justice? Do we have to ask? An examining officer may exercise his powers under this paragraph whether or not he has grounds for suspecting that a person falls within section 40(1)(b). So there is no question that they had the right to detain him, since they have the right to detain anyone at all. What is at issue is their goal, as expressed in their actions during the interrogation. So, while they don’t need any reason to think the person is a terrorist, in fact don’t even need to think that they are, and could interrogate people chosen at random, they can only do so, as stated in the section of the Act quoted above, “for the purpose of determining whether he appears to be” a terrorist. Foust suggests that threatening to expose GCHQ could count as terrorism, under the portion of the definition that includes activity that “is designed seriously to interfere with or seriously to disrupt an electronic system.” That sounds pretty far-fetched to me, but it is in keeping with the pattern that we have seen, where security officials demand sweeping powers, codified in vaguely formulated laws, and then proceed to push the boundaries of even those laws and reinterpret them (secretly) beyond all recognition. It’s a bit like firing an employee in the US: You don’t have to have any reason, but you can’t have an illegal reason. It can be because you have indigestion, or because an angel told you to fire her, or because she’s too beautiful, but it can’t be because her skin colour clashes with your wallpaper or she’s pregnant or is in a wheelchair. And evidence for your illegal reasons are not just your explanation of the firing (or lack thereof) but other comments and actions surrounding it.